An entire generation of Brewers fans, myself included, weren’t even alive the one and only time they appeared in the Fall Classic. If you grew up in or around the Milwaukee area, you’ve no doubt heard tales of that fateful season from those who lived through it. And why wouldn’t you? In the three following decades, the franchise wouldn’t offer anything close to the excitement that fans of the early 1980s must have felt. A game 7 World Series loss to the St. Louis Cardinals immediately gave way to a 25-year playoff drought. Once Molitor and Yount were gone, the high benchmarks for players were the likes of Ben Sheets, Geoff Jenkins, and Jeromy Burnitz. Meager years followed by famine, where Brewers faithful had the immense pleasure of showing up for excruciatingly slow-paced Doug Davis starts backed by the likes of Brady Clark, Keith Ginter, and Lyle Overbay. Expected to be excited for free agent acquisitions named Jeff, like Jeffrey Hammonds and Jeff Suppan, and a constant stream of prospects that never seemed to pan out. Given enough time though, a few of those prospects eventually did pan out. Homegrown talent like Ryan Braun, J.J. Hardy, and Prince Fielder helped end the playoff drought, riding into the playoffs on CC Sabathia‘s back in 2008. That stretch of baseball was easily the most exciting period Brewers fans had had in 25 years and just making it was enough. With the position player core intact and the additions of Zack Greinke, Shaun Marcum, and Nyjer Morgan, the Crew finally won their 1st National League Central Division title in 2011. They’d go to advance all the way to the NLCS, only to lose in spectacular fashion to the St. Louis Cardinals in 6. 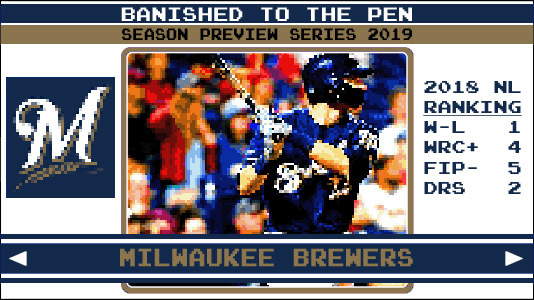 A loss that would echo in most Brewers fans minds clear to the 2018 National League Central Championship season. Which brings us to the current squad, led by two MVP-caliber outfielders in Cain and Yelich, and a roster that is largely intact from the year prior. A few veteran arms have departed, but the 2018 reinforcements of Brandon Woodruff, Freddy Peralta, and Corbin Burnes are all being trusted with starting on the Major League roster in 2019. Jhoulys Chacin and Zach Davies round out the rotation and are backed by what should be a solid bullpen headlined by Josh Hader. The lineup largely remains the same as it was towards the latter half of 2018, with the exception of the addition of Yasmani Grandal, who is consistently one of the top framing catchers in baseball. He’s a force at the plate, as well, as he had a 125 wRC+ with the Dodgers in 2018. What is the Brewers’ most recent accomplishment? Coming off their most successful season since 1982, the 2018 Milwaukee Brewers came within one game of their second World Series appearance in franchise history. How will the Brewers define success in 2019? The Brewers are expecting to take a step forward in 2019, which would indicate a clear World Series or bust mentality. There’s only one correct answer to this question, and that’s the oft-mentioned Matt Albers (see the EW wiki for more on his significance). Coming into the final year of a 2-year contract, the 36-year-old veteran reliever hopes that health and a grip change will be the keys to recapturing the effectiveness he displayed in the first half of 2018. While spring numbers have been less than eye-popping, recent TrackMan data from bullpen sessions has shown increased spin rate and velocity. Chacin’s grip advice is also supposed to help create a bit of deception. Having an effective Albers may prove to be particularly needful, considering recent news that Jeremy Jeffress and Corey Knebel may both begin the season on the shelf.